You woke up early this morning, and you’re motivated and ready to write and submit several new articles to take your article writing to a new level (on a Saturday, no less). You turn on your computer, and as the machine boots up, you consult your article idea notebook and start brainstorming in your head about your first article. You think to yourself, “Ugh, not again,” and you proceed to reboot your Internet router. As it’s rebooting, you start typing the article and put checking your email on the back-burner. An hour passes. You finish the article, and, after a quick review, you’re satisfied with it. You go back to the Internet window to submit your article to EzineArticles and the Internet is still down. You try everything – rebooting the router again and then rebooting the whole computer – nothing works. You’ve been hit with a case of Internet downtime that’ll last until you can get in contact with your ISP. There are tons of different reasons why you might experience writing or submission downtime (e.g. your ISP connection dies, your computer crashes entirely, you’ve picked up a bad case of writer’s block, maybe it’s self-imposed, etc.). Update Your Editorial Calendar – Jot down your next month of articles. Building a schedule like this will help you accomplish what you want to accomplish and help you write on a regular basis. Review Your Strategy – Sometimes we get so caught up in doing, doing, doing, that we have no time to reflect on the vast amount of progress we’ve made and evaluate that progress for what it’s worth. Stepping back, reviewing your article writing plan and examining how it fits in with your overall goals is a valuable activity to help you polish your strategy. Plan Other Distribution Channels – Always have a printed list of your published articles on-hand. Look at each article and ask yourself, “Where else could I use this?” Make note of anything you can come up with. Brainstorm Article Repurposing Ideas – Take your printed list of published articles and think about ways that this material could be easily repurposed. Could you build a teleseminar or video around a group of articles? What about a podcast or webinar? 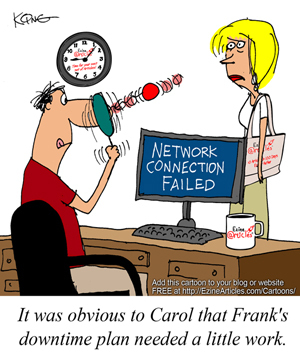 Simply Write – If your Internet is down but your computer works, you can still use a word processing program to outline or write out articles without submitting them. If you’re left completely without a computer, you’ll have to do it the old-fashioned way and pull out a pen and paper. Head to the Local Library/Bookstore – Pick up books written by other experts in your niche, and do some research to give your writing new angles. When you finish reading, you’ll not only have acquired the knowledge for multiple new articles, you can also write a book review article with your analysis of the content. Become a Student of Article Writing – Educate yourself on the art and science of article writing. Stay at the library and use their Internet to do some research on effective article writing strategies. Downtime, self-imposed or not, will happen, so it’s a good habit to keep hard-copies and digital copies of your work available at all times. That way you always have a plan to convert downtime into productive time. Have any other downtime plan ideas to share? Let us know by leaving a comment below. Also, if you liked this cartoon and want to see more like it, check out the Cartoons Archive. You can even add them to your own site with our easy cut-and-paste HTML code feature. Great article, Marc! This downtime plan idea is great for progressing in article writing and every other task/project area! As a life coach I am encouraged to promote this concept with my clients in whatever area they seem to struggle or desire to make forward progress. Bull’s eye! It’s like you’re a fly on my wall. There are seemingly unlimited reasons to not write that article today. Hopefully, next time one such reason strikes, I can draw on one of these helpful ideas from the “downtime plan”. this is great. Thanks so much. Excellent Article! I actually never thought of using downtime in such a productive way. I would like to be able to pass this on to my clients as well. In fact just last week one of my clients wanted to know how to use downtime when behind the wheel of their car and in hour long traffic lineups. A voice recorder and some creative thinking would be a huge help for this particular client. The idea of the “Downtime plan” reminder us of the word procrastination and it`s effects. Thanks very much for this piece. It contains value. You are absolutely correct Marc. Thanks for this great article! Wonderful topic, Marc — thanks for a value-packed article! During downtime, you can always tackle a few loads of laundry or wash your car. Any activity you’ve put on the back burner comes to mind. One thing I like to do is check to see who’s got a birthday or special occasion coming up and get some greeting cards ready to be mailed out. Otherwise, I’m usually rushing around at the last minute and oftentimes find myself sending out “belated” cards. Not cool. My favorite thing to do during downtime is simply let my mind wander and let my creative juices flow. These are the moments I come up with the best headlines. Great article. I always have downtime and especially at night. What I do is normally write out a template for my articles and create new titles that way I have everything I need to get started the next time I am in front of a computer. Great tips! I like the idea of re purposing. In fact, after the article is published, I rarely look at it and think of re purposing as audios/teleseminars etc. However, I get caught up thinking of new topic. Secondly, you have suggested to ” Take your PRINTED list of published articles ‘ and work from there. This is a huge mindset shift for me and inspires and moves me to take action. This is MUST read article for entrepreneurs, who get stuck, when such downtime hits them. Thanks a lot. Great tips on downtime ideas. For me, I’ll take the opportunity to relax with a book, and maybe get some ideas from there. Great tips! I like the idea of re purposing. In fact, after the article is published, I rarely look at it and think of re purposing as audios/teleseminars etc. “Downtime Plan” is an interesting article. It depicts the proverb which says that”every disappointment is a blessing”.For the Entrepreneurs it is especially motivational,because they are always capable of changing circumstances to their advantage. Time like we all know is very important,if not even more important than money. Money and money making processes are unlimited,but time is limited,because we have only 24 hours in a day. Thanks once for this article. Another great activity you can try when you have downtime is journaling. You only need a pen and a journal for that. You’ll be amazed at what you come up with. As i just opened my eyes .. i stumbled upon your email – or at least one of them which caught my eye instantly (again!) ..
And with a link to this blog post for sure. And a funny moment of recognition ..
downtime … yes most certainly .. it happens! .. Even as i am typing it out for you now .. It translates itself into weird behavioral patterns while i am in front of the puter screen ..
i get bouts of low performance moments where i run fresh out of ideas of what to next … just pointlessly clickin some links .. mostly my own! ..
Running three self hosted blogs and taking into account that i am just a poor lil newbie in the blogging world .. something that i just had to attend to following the birth of my small independent – indie – record label called Witchy records ..
Well taking all that into account the webs and the blogs are up and running and so i might indeed use the article writing downtime thing from now on ..
And would like to mention that for me i absolutely dread deadlines .. i tried to write a book against a self-imposed deadline and it had precisely the opposite effect on me … i just laid down the book work . So i believe also there’s no rush for keep on posting articles .. one after the other .. i’ve seen an Expert Authors’ profile with lots of articles under his name .. But looking at the chronology of their posting their stuff is quite something i immediately can relate to this post about downtime when writing articles. You see they have no rush … someone put an article on EzineArticles in january (might be fiction) and then next article posted was March or April or so .. So my point being that by getting some kind of a warning system urging me unconsciously to step away from my computer and get something else going and i find it’s time for me to purchase some notepads because i am running out of real paper .. and blue roller ball points ..
and just write stuff down let the storm pass and get some derivative ideas noted onto paper ..
Deepanjolie – Those are great additions to the list. Thanks for sending them! I find downtime really a gift – for taking a nap, doing a few minutes of meditation, and even reading a book or a magazine. Or going for a walk! But I also agree with Lisa and Rob. I almost always have a notebook and a pen with me, because I get ideas when I least expect them, for example on a walk, or yes, while waiting in line at the bank or something like that. Elisabeth – Thanks for the kudos on the cartoons! I really cannot see how to back this up viably on my end.